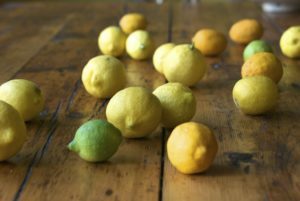 Chef Poppy shares some special recipes in her own words using the generous harvest of lemons this year. I brought in my glass jar of Preserved Lemons. Gorgeous as they are to look at, they add an altered lemon flavor to Moroccan Cooking. We used them in the Moroccan Chicken, along with the traditional spices: turmeric, cumin, ground ginger and cinnamon. We started with a healthy and strikingly easy appetizer, a Healthy 7 Layered Dip. As the chicken was cooking, we made lemon curd. I think most everyone saw how easy it was to make and how it tastes so much better when it’s fresh. Preserved lemons are used mostly in North African cultures (really an indespensable ingredient). It is the rinds that you generally use in the cooking, although the pulp is sometimes added. The whole lemons are cut in an “X” from the top, almost cutting them in quarters. Rub all surfaces with the salt and put in jar layered with salt. Add enough other lemons to fill and add lemon juice to cover. I added cinnamon sticks for added flavor, but many recipes call for peppercorns and bay leaves as well. Experiment! Scrub 3 to 5 organic lemons … enough to fit in your medium sized jar. Press lemons down to release juices. Add cinnamon sticks, then squeeze additional lemons. To assemble, spread out the ingredients in thin layers on a platter. Humus, chopped tomatoes, cucumber, bell pepper, fresh herbs (we used mint), sprinkle of olive oil and a sprinkle of sea salt. To make it even healthier, we had carrots and celery for dipping. Cover chicken with olive oil and add spices. Marinate for at least 2 hours. Overnight is fine. Saute chicken in fry pan for 2 minutes on each side, turning it golden. place intaking pan with chicken stock and preserved lemons. Add parsley and/or mint before serving. We served the chicken with traditional couscous. Lemon curd is a delightful spread and can be served on cake, in tarts, or just a dollop with berries. This is a great recipe to have in your repertoire. Melt butter in double boiler or heavy bottomed pot. Beat the eggs and add SLOWLY to melted butter (I tempered the eggs, adding a little melted butter to them before adding the eggs to the hot butter. Let cool a bit before serving. Extra curd can be stored in the refrigerator for a week and used as a spread on bread or cookies. Enjoy the spring vegetables coming into the Farmers Markets, especially artichokes and asparagus.